Let's get one thing straight: when you were a young child between the age of 1 and 2 years old, the best you could hope for at the end of the day was that your OshKosh B'Gosh wasn't destroyed by mushed carrots. But that's only because your parents weren't Kim Kardashian-West and Kanye West. North West has already become a Vogue star and sat front row at Paris Fashion Week, all before attending pre-school. Just like mom and dad, her name attracts headlines and cameras, and also like her parents, she's already stocked up her wardrobe with designer threads. But like all kids, North takes different traits from both her parents. 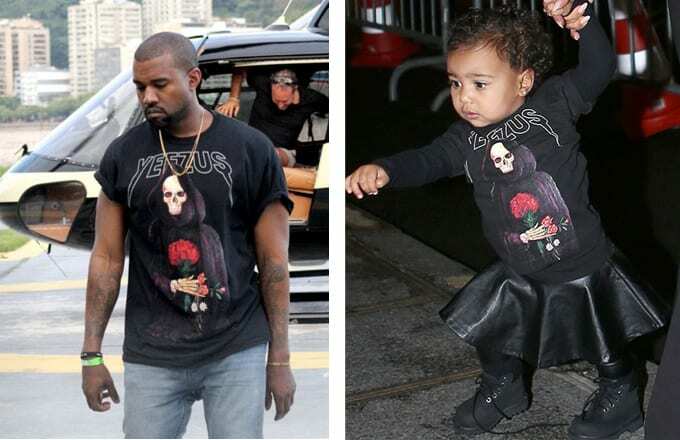 When it comes to killing the fashion game, it seems like the youngest West is influenced by her pops. Need proof? Check out these 10 Times North West Dressed Like Kanye.